Focus on commitment, not motivation – Motivational speaker Jim Rohn said that “Motivation is what gets you started. Habit is what keeps you going”. This continues to be true for me in my personal life as well as my business. I commit to achieving a goal, and then I get myself into the habit of doing what I need in order to see it through. This is exactly how I have written fourteen books, become a sought after speaker, and achieved many goals that were beyond my wildest dreams. 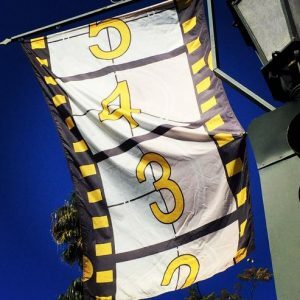 This week I’m in Santa Barbara for the International Film Festival, and once again I have the opportunity to spend time with some of the most successful actors, screenwriters, directors, producers, and other industry professionals. Time and again they share their own story and the success tips they continue to use to further their art and career. They speak about seeking knowledge, not results, which means they are looking at the bigger, overall picture instead of only what is right in front of them. For example, when Casey Affleck set out to achieve success in his life, acting was only one thing he considered. Once he had some experience under his belt, he dedicated himself to learning his craft, which included acting on the stage as well as in film and television. He also did work behind the camera as a way to round himself out. The knowledge he continues to gain serves him well, instead of only focusing on the immediate results. Make the journey a fun one. Instead of worrying or thinking about what could happen that would not bring you the results you are looking for, have fun with everything you learn and do. My writing is an excellent example of that. I could have easily compared myself to others, but instead I chose to keep my head down and write for thirty minutes to an hour each day. It’s been a fun process to turn myself into a writer over the past decade. Get rid of stagnating thoughts by focusing on the positive. This is always a good idea, and success tips seem to leave this step out much of the time. No good will come from thoughts of failure and you want to stay in control of these types of thoughts. Use your imagination to stay loose, creative, and free. It wasn’t until I came online in 2006 that I began to think of myself as a creative person. A big part of this process has been to allow my imagination to roam free and to know that anything and everything is possible in our world and life experience. Eliminate distractions whenever possible. I demand absolute quiet while I am writing each morning. When you are focused and have clarity as to your goals, you will not want to be distracted until you have finished the task or activity you are working on. Get used to the idea of being alone with your thoughts for some period of time each day. Don’t rely on others to make your success possible. As children we are dependent upon the adults around us to help us succeed with even the tiniest of goals. As an adult, take full responsibility for your success and be willing to do whatever it takes to make that happen. Take regular “down time” to renew, refresh, and rejuvenate your mind and body. This will be unique to you and may well change over time. Make appointments with yourself to get out of your head and have some new experiences with a fresh perspective. I hope these success tips have been helpful to you as an entrepreneur. 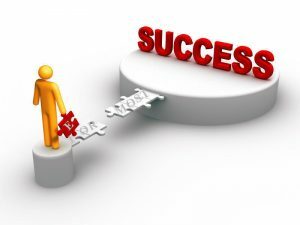 Here is another article I wrote about setting and achieving goals as an entrepreneur that you may find valuable to your process. I’d welcome the opportunity to answer your questions and to discuss this topic further. This entry was posted in Online Marketing Tips and tagged Entrepreneurs, Success, Tips on February 7, 2017 by Connie Ragen Green. I’ve hosted a Productivity Challenge online every spring for the past seven years. 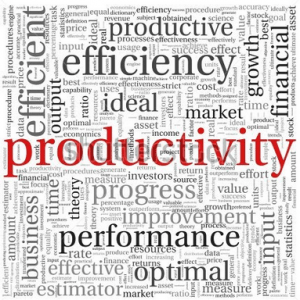 I thought I would share my thoughts on personal productivity with you here in preparation for the next one. There never seems to be enough time to get everything done. Actually, there is. You’re wasting too much time and spending your time on the wrong things. There are people that run over a hundred companies simultaneously and still have time for dinner with the family each night. They just use their time more wisely than the rest of us. Learn how you waste time. Even if you’re the best worker at your company, you still waste a lot of time. Determine how you waste time at work and at home. Notice what you do when you’re sick of work, tired, bored, or stressed. Using your time effectively is a key component of becoming more productive. Just for your own education, keep a stopwatch at your desk. Keep track of how much valuable work you do each day. This doesn’t include time spent checking your email, looking out the window, chatting with a coworker, or drinking coffee. Eliminate distractions. While some people can concentrate with chaos all around them, most of us do best with as few distractions as possible. Control what you can in your environment. The fewer distractions you have, the more you can accomplish. Prioritize your priorities. If you have 10 priorities, you don’t have any priorities at all. Develop a list each evening of your three top priorities for the next day. Do everything you can to accomplish those three things. Avoid wasting time each morning trying to determine how you’ll spend your day. You should already know when you wake up. Spend time on the most effective actions. There’s a difference between being busy and being effective. Imagine you’re having a dinner party and your house is a mess. You could be busy cleaning out your bedroom closet, but that’s not accomplishing much in this instance. Take regular breaks. You might be able to work hard from 8am to noon, but you’ll have nothing left in the afternoon. Studies have shown that taking a 10-minute break each hour greatly increases productivity over a full day. Give yourself an even longer break every few hours. You’ll stay fresh and find your ability to focus is less-compromised later in the day. Develop a morning routine. The most successful people are the most productive. And the most successful people also have a morning routine. Get out of bed early and get your day started productively. Have a good breakfast, exercise, meditate, or do whatever else will get you primed for the day. Apply the same concept to work. Have a work routine that addresses those tasks you do each day. Plan them and get them done. Choose the best time for each activity in your life. Do you buy groceries at the most convenient time, or do you go when everyone else is at the store? You could save a lot of time by going after 7pm in the middle of the week or early on Sunday morning. Save what I refer to as your biological “Prime Time” hours for the work that is most meaningful to you. Get more done with the time you have available by increasing your personal productivity. Evaluate how you’re using your time, both productively and unproductively. Find your weak spots and develop a strategy to improve your behaviors and your approach. The key to productivity is using your time as wisely and efficiently as possible. And be sure to watch for my next Productivity Challenge coming up soon. This entry was posted in Online Marketing Tips and tagged Personal, Productivity, Tips, Triple on January 24, 2017 by Connie Ragen Green. Recently I was asked to share what it means to me to have an online business. Tips I shared with the person I was discussing this topic with included details about the time and financial freedom one is able to enjoy as an online entrepreneur, as well as the lifestyle you are able to live when you can work from home, or from wherever you are in the world with an internet connection. Long ago I worked as a classroom teacher, and to make ends meet I worked simultaneously as a real estate broker and residential appraiser. 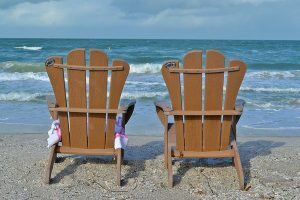 Over the years I grew weary of working six or seven days each week and still not being able to take time off or save much money. When I made the decision to leave that world behind in 2006 it was to live the internet lifestyle and to create a life for myself where I would have both the time and the income to call the shots every day. My life changed completely when I took action on my dream, and you can do the same thing if you understand what it takes to make it happen. Be the toughest boss you have ever had in the physical world. Focus and discipline will mean the difference between success and failure. Take action every single day, if only for fifteen minutes. Keep what I refer to as a “dynamic to-do list” and get into creative mode by writing down your thoughts and ideas and then taking action to implement them. Remember that online entrepreneurship is a business. Treat it like a business and it will pay you like a business. Treat it like a hobby and it will cost you like a hobby. Know that the three parts of your business that are most important are posting to your blog at least twice a week, emailing your list as least twice a week, and creating simple information products to sell to others. Good enough is good enough, so do not complicate it. I hope these online marketing tips have been helpful. You can achieve success and have time freedom and financial freedom if you follow my steps. Having an online business means you are in control of your own life and your destiny, and there can be no greater reward when it comes to your business. Take a Look at My Internet Marketing Six Pack to Get Started as an Online Entrepreneur. This entry was posted in Online Marketing Tips and tagged Internet, Lifestyle, Marketing, Online, Tips on November 10, 2016 by Connie Ragen Green. This entry was posted in Online Marketing Tips and tagged Business, Content, Marketing, Tips on October 10, 2016 by Connie Ragen Green. Have You Chosen Your Primary Niche? What are you interested in, have passion for, and experience with? How will you serve those who come to you for information, recommendations, and guidance? Are you willing to work diligently in this niche for at least six months? The above image is one you may remember from middle school mathematics. 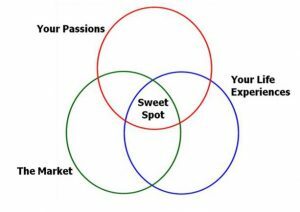 It is a three circle Venn diagram to help you choose the right niche for your online business. Once you have done this, you are ready to begin building your niche. How Do You Begin Building A List? Where will people find you online? What are you offering in exchange for their name and email address? How will you follow up with them? When will you reach out to them in a unique way? Think about each of these questions, listen to the podcast, and then comment below. I would love to hear your thoughts on these ideas and concepts in regards to how defining and refining your niche and building a responsive list will enable you to be a more successful entrepreneur. These list building tips online are intended to focus and guide you through the process of building a success online business. If you’d like to download my latest Focus Guide on Repurposing Your Content, click on this link. Feel free to share it with anyone who may benefit from what I am sharing. Also, my Study Guides are available here for many of my recent podcasts. Are you ready to be surprised? Recently, I have introduced a new feature during these podcast training calls. I will always have the latest course or program, either one of my own or one offered by someone I highly recommend, at my Surprise! link. Check it out today and see what I am recommending this time. If it’s not my own program, product, course, or live event then it’s always from someone I know, trust, and highly recommend as a great value to you as an online entrepreneur. My most recent book is now available. 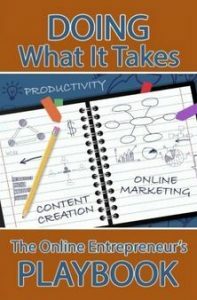 It’s entitled Doing What It Takes: The Online Entrepreneur’s Playbook and I’d love to hear your thoughts on it by way of a review on Amazon after you read it and implement my suggestions. Are you already a part my list community and receiving my daily email updates and training? If not, please give me your first name and primary email address in the form on the right-hand side of this site. If you are brand new to my podcasts, you will be interested to know that this specific training call, as well as all of the calls in my podcast series is intended to teach you and other new online entrepreneurs how to take your business to the next level quickly and effectively, and as a way for me to share my exact methods, techniques, Case Studies, secrets, and advice on creating a profitable and lucrative online business using the ‘multiple income streams’ approach. People on six continents have now discovered that starting an Internet business is the very fastest way to achieve both time and financial freedom, as well as to great success in all areas of your life, and you need help to get there quickly. That’s why I started this online marketing tips podcast for my community. You will see that each podcast session is first recorded live as a teleseminar, and then repurposed into a podcast to extend my reach to the world. Please join my list (opt in on the right) to be included on these calls, and be sure to introduce yourself and share your site for optimal exposure for years to come! Also, check out my Podcast Show Notes site to see how you can subscribe at no cost to both of my podcasts, and please leave me a review on one or both of them if you are so inclined. 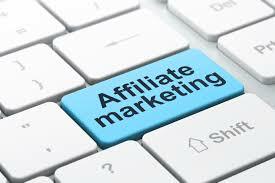 If you would like to get started earning income online right away then I recommend affiliate marketing as the stream of income that will allow you to “earn while you learn” You may now pick up my popular training on winning affiliate contests and other online marketing tips for only seven dollars at Affiliate Contest Secrets. This training regularly sells for $27. Use the discount code CONTEST to bring the price down to $7. This training has been completely updated for 2016 with the latest information, strategies, and Case Studies for you to use in your own business. Please be sure to leave your comments below so that I may get to know you better and to serve you as you continue your journey as an online entrepreneur. Getting started with an online business will change your life forever and my reward is your massive success! 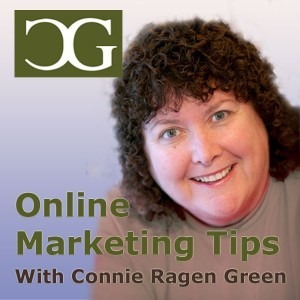 Subscribe To My Online Marketing Tips Podcast Today! This entry was posted in Online Marketing Tips and tagged Building, List, Online, Podcast, Tips on October 5, 2016 by Connie Ragen Green. 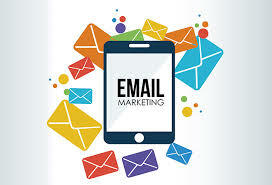 Freebies, lead magnets, tripwires, ethical bribes, opt-ins, and so forth can be lucrative ways to collect email addresses from your audience so that you can market to them via email. When you give away small things to help them accomplish their goals, you’ll endear yourself to them in a new way. Here are some valuable blogging tips – beginners can jump start their progress by following and implementing these tips. Use PLR – To create your freebies consider using private label rights information that will appeal to your audience and help further your relationship. One Problem – Help them solve one small problem, not the entire kit and caboodle. You want them to come back for more, so in your freebie give them enough to show them your work quality and skills but don’t give them the farm. One Customer – Don’t try to please everyone, make each of your offerings focus on one persona / customer at a time. Create a profile for the ideal customer and direct your product only to the people that fit the profile. This works better than trying to appeal to everyone. Make it Short – A checklist, a spreadsheet, a simple app – these things won’t take much time and money for you to create but will make a huge impact on your audience member if you are careful to ensure it fits your audience. Remember that you can also choose to “give it away” for just a buck. Optionally, if you use a system like Gumroad.com, you can let them pay whatever they want, as long as it’s at least a dollar. When a freebie isn’t actually “free” but is very inexpensive it can make more to the user and make them value you more. When they value you more, they’ll be more likely to come back. Remember inside your opt-in provide a link back to your blog, and to other products, services and offerings you have. People get bored without pretty and interesting things to look at. In the case of your blog, you also want the images to be relevant. You want them to expand on your point and help your audience not only understand but to remember the information you provide. Images can brand you in such a way as to ensure that your audience really remembers you. Images – You can get stock photos from a variety of sources including StockFresh.com, StockUnlimited.com, and others. Be sure to read the licensing agreement and try to learn about copyright laws and fair use. Video – Today, video is one of the best ways to create a loyal audience as well as engage with them. They love seeing your face and feeling as if they know you. You can create video the easy way or the hard way. Easy – use your phone and decent lighting. Hard – buy professional equipment. Either way, video will get great results. Graphics – Infographics, memes and charts are a great way to explain hard concepts to any audience. There are awesome programs. A great infographic software to try is Piktochart.com. You can also hire a graphic designer to help you. If you have the data, they can create the graphic. You can use programs like Canva.com to create amazing graphics, and use your phone to make video. Today, it’s not impossible for an amateur to create wonderful images, video and graphics but if your skills aren’t up to par, don’t think it’s too expensive to get help from a professional. Another way to get more loyal blog followers is to become the go-to person in your niche. You can be viewed as the authority by being a guest on a podcast, TV show, blog, and so forth. You can also build authority by demonstrating your skills by creating amazing products and services that your audience wants to use. Write Long Form Posts – Long posts, more than 1500 words in length, are a great way to show what you know. Well-organized, long content pieces show that you know your stuff. When you know your stuff, people will gravitate to your content. Publish a Book – When you can put your knowledge down in book form people automatically view you as smarter, more successful, and intelligent. Don’t let a book scare you, if you can write a blog post, you can write a book, one page at a time. Speak – You can speak in public events, or by creating a YouTube channel, or even by recording talks and publishing on your blog. When people are able to speak clearly, tell a story and explain concepts in this manner it automatically makes them seem more authoritative. Another way to build authority is simply by finding your authentic voice and using it on your blog and across all social media networks that you and your audience use. When you are simply yourself, it’s a lot easier than being false because no one can be false forever. As a blogger, there is almost nothing more important than truly engaging and interacting with your audience. You want your audience to comment, like, share and sign up to your lists or buy your products and services and you can accomplish that is by being engaging and encouraging. To encourage engagement it’s important that you know how to get them to respond. It all starts with truly knowing your audience. Understand that even if you did a lot of audience research five years ago when you began your blog that even when demographics stay the same often audiences grow and change. For example, imagine what it would be like if Dawn dishwashing soap still marketed to you using the same techniques and issues from the 1950’s? The message probably wouldn’t even reach you and if it did, it would not go over well. Stay up to date and interact with them in a way that makes them happy. After all, it’s really about them, not you. The final thing you need to know about blogging and keeping a loyal fan base is that you should focus on bringing them back to your blog, every chance you get. There are many ways to do this. Blog Broadcast – If you have an autoresponder, for every post you create, also create an email to talk about a similar topic and then link back to the blog post so that they can learn more. Social Media – Announce blog posts on social media with a unique blurb. You can post about the new post more than once on each platform, more on Twitter, but don’t make each post a duplicate of the other. Instead, add a unique blurb to each one, even if it’s the same link. You want to find ways to bring readers and customers back to your blog to read your new blog posts, as well as learn about your products, services, and programs. When you have a way to interact with your audience on a regular basis through blog comments, social media, email, books, public speaking and more will help people become even more loyal to you as a blogger and an expert. You don’t have to do everything at once, but you can start by adding sing up boxes to your blog posts, and sharing more on social media. As you build up your blog, do more. Track everything so that you know what works and what doesn’t work. Do more of what is working and less of what is not working. This entry was posted in Online Marketing Tips and tagged Beginners, Blogging, Jump, Progress, Start, Their, Tips on August 26, 2016 by Connie Ragen Green. Identify both your current audience and your desired target audience. Use SEO (search engine optimized) keywords to attract new readers to your work. Establish yourself as an authority on your topic(s). It really boils down to posting relevant content and finding ways to remind them about you via email, social media and even ads. Let’s look at the ways you can get more loyal blog followers and keep them coming back for more. You’ve most likely heard that before. But, it’s not that simple. You can’t post anything and end up with fans following you and begging for more. You have to know who your audience is, and what they need to know and post that. 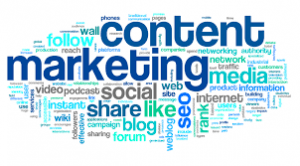 Content needs to be relevant and of a high quality to be effective. 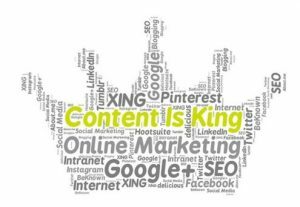 Relevant – The only way you can ensure that your content is relevant is if you do the work necessary to get to know your audience so that you can deliver the type of content they want and need. High Quality – While you do not have to be perfect, don’t just slap up anything. If you buy PLR (private label rights), ensure that you rewrite it and make it your own. If you outsource any writing, edit the writing and put your voice into it, and always add a watermarked image so that when it’s shared it comes back to you. Consistent – Finally, post consistently. You don’t have to blog every single day. You want to blog multiple times a week and provide meaningful content to your audience. Otherwise, they might get bored and stop visiting. When you post relevant, high-quality content on a consistent basis in a variety of forms such as images, video, text and so forth your audience will be more likely to stay interested in what you have to say which will make them keep coming back, sharing and engaging with you. Plus, potentially buying something you created or promote. Just posting content is not enough. 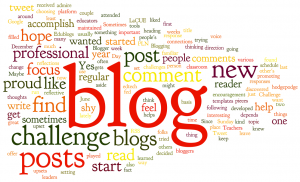 There are more than 100 million blogs in existence. That’s worse than a needle in a haystack. In order for anyone, including your customers, to find you, you’re going to have to promote each piece of content that you post. Social – Whatever social media your audience uses, you need to be using. While you can’t use them all 100 percent alone, you can at least choose the top three that is most popular with your audience. If you can outsource some of your social media marketing then you can do more, but at least start with the top three. Share and engage about your blog posts to bring more traffic and create more interest in your content. Make it Simple to Share – Don’t make it hard on your readers to share. Get a social plugin that enables you to add share buttons at the top and bottom of your posts. Make it a point to ask your audience to “click the like and share buttons.” Make it part of your call to action. Get Them on Your List – In addition, put a box at the bottom of every single page to encourage your readers to sign up for your newsletter. Leadpages.net offers a really great and attractive option for “lead boxes” that you can put on your blog to help people get what they need. You can do this easily with a few plugins, but – do not forget to engage with your audience when they comment on your shares. You don’t want communication to be only one way. You want to build relationships so that they don’t just want to read your blog due to the great information; they want to read it because they care about you. A call to action (CTA) is so important if you really want to make a difference. There are different ways to create a call to action. Your CTA can include asking your audience to share, like, follow, join, sign up, buy or whatever it is that you want them to do. If you really want them to take action, clearly state what you want them to do. Ask for a Comment – A great way to get your audience to act and come back for more is to generate more comments to your posts. You can get people to comment more if you ask them to. Be the Devil’s Advocate – If you really want to get comments rocking, try being controversial. This can be risky so be mindful of the potential repercussions. Try calling out a situation that makes you mad, sad, and upset. But, try to end it on a positive note if possible. But a Subscribe Button after the Post – A great way to get people to subscribe for blog updates is to put a Lead Box on the bottom. You can use Leadpages.net for this. It works well and it was developed by marketers. Offer a Free Discovery Call – A great way to get your reader’s attention is to offer a short 15-minute discovery call. Put a sign up box below the post along with words that attract their attention and get them to want to give their email address to sign up for the call. Ask Them if They Want to Learn More – A really effective CTA asks your readers if they want to learn more, then using an attractive “learn more” button will entice the reader to click. On the learn more page it can either be more information or you can make it an easy one step opt-in box so that you can send them more information via email. Give Them a Special – If you’ve talked about specific products or pain points in the blog post and you know about a product or have created a product that will help them, make them a special offer at the bottom of the blog post. Offer a Freebie – Match your freebies with the topic of your blog post, and offer a download button for the freebie that relates to the blog post. Collect their email address so that you can add them to your list. If you use software like Leadpages.net, you can avoid sending to duplicate email addresses on your list, while still offering the freebie to your readers. Ask Them to Join Your Mailing List – Get right to the point and ask them if they want to learn more, get reminds of new posts, and so forth and ask them to sign up for your mailing list. Let them know the benefits of doing so, and you’ll get more sign ups if the sign up box is after your posts. There are many more ways to get your audience to act on your content but you’ll need to tell them what to do. People are relatively lazy, so make it easy for them. You’ll get a better response. This entry was posted in Online Marketing Tips and tagged Beginners, Blogging, Tips on August 22, 2016 by Connie Ragen Green.